Once you have your staff hired, it’s time to open the floodgates and let the children in. Although you have teachers, your children don’t always need to be learning something. Playtime must also be involved in order to maintain productivity and effectiveness. You must make sure there is a variety of toys from girlish toys to boyish toys that everyone is allowed to use in your childcare center. Make sure to allow the kids playtime outside where they can work off energy. When you’re picking toys for different classrooms, consider the different age brackets that you will be serving. Do not get toys that only older kids can play with just like you will not want only toys that younger kids can play with. When you go toy shopping, you should seek out toys for all ages, for both genders, and be as inclusive as you can so long as it is safe. 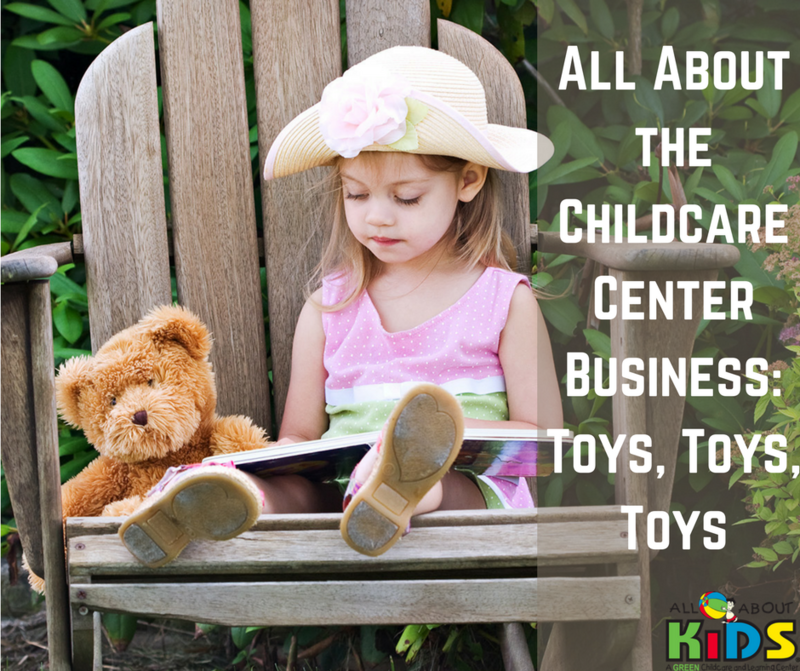 A well-balanced toy collection is important for any successful childcare center. A lack of adequate toys can ruin chances for new clients when they tour the facilities or send children home with complaints about lack of stimulation, toys, or fun things to do. When you go shopping for toys for your childcare center, keep in mind toys that might have been recalled, especially if you’re shopping at discount stores or garage sales. Also be wary of purchasing toys that are broken, chipped, or pose any threat of wasting your investment or harming the children. While bargain shopping can save money at first, if you spend most of your toy money on garage sale toys that break early on or look shoddy, it can hurt your budget or your reputation. Before you spend all of your money on cheaper toys that may be worn out, see if there are any toy rescue missions that can offer discount toys that are in better condition. You can also check online stores like Amazon which can sell new or barely used items in great condition at usually a cheaper cost than in stores. Exhaust all your options for purchasing before you settle on any discount options for your childcare center. Child care centers in Ohio know the pain of having hundreds of toys and trying to find where to store them. Some childcare centers can even be likened to some of the largest child play rooms in the world as they offer hundreds, sometimes thousands of toys that at the end of the day must all be put back where they came from and for rooms to be clean and spotless. Organizing your play areas and keeping your toys in their rightful place is an organizational skill that many covet. An attention to detail and some level of obsessive compulsion for a clean and tidy room are necessary, but learnable skills. There are a number of ways and tips you can use to keep organization in your childcare center and All About Kids has those tips and tricks down to an art with our setup. All it will take is consistency from you and your staff to have the kids clean up at the end of the day and for you to do the finishing touches for cleanup time. Cupboards, baskets, cubbies, shelves, and chests are all great ways to organize. Keep like-items paired with other like-items to know where things go at all times and encourage children to put toys back in the right places to create good habits in them that they can take home. If shelves are too high, have your supervisors or teachers help the kids to put items away on them and do not encourage kids to climb onto chairs in order to put things away. Have all craft items, especially scissors, pins, tacks, and staples, in a high place that only the kids cannot get to in order to insure safety in your childcare center. With all the children in your childcare center handling the toys on a daily basis, germs will be quick to spread if they are not cleaned regularly and thoroughly. Toys should be cleaned on a daily basis, particularly those that are used with smaller children who are prone to putting things in their mouths. Babies and toddlers put everything in their mouths and so sharing toys can also share illnesses and other germs which can potentially put other children in danger. If you don’t have time to wash the toys daily, you should hire someone who can. Many toys are dishwasher safe and all it takes to clean them is gathering them up, loading them in, using the right cleaner, and setting the dishwasher to go. Many childcare centers set the toys to clean, leave, then pull them out of the dishwasher in the morning. This is only needed for younger children. For older children, toys should be sanitized at least once a month and sometimes more during flu season. To prevent toys from being broken or lodged into places where they can break or get stuck, place them into mesh bags before putting them in the dishwasher. Allow the toys to thoroughly dry before you put them back in the children’s play area. If they are left overnight, this usually presents plenty of time for drying. For older children who continually put toys in their mouth, talk to their parents about creating a plan to dissolve the behavior through interaction and keeping the child busy. Remember that the dishwasher water can get extremely hot and melt some plastic or other toys. Before you place toys in the dishwasher, be sure that you know 100% that they are dishwasher safe. If they are not, simply wash them down with soap, water, and lastly a bleach mixture before allowing them to air dry. If you are washing things like dollhouses, building sets, or large play things, you can spray them down with a disposable towel. For stuffed animals, consider washing them in a washing machine on a gentle cycle if necessary. They can be harder to clean and you should take extra care to make sure they are washing machine safe. If nothing else, consider leaving them outside in freezing weather for a few days as this can kill germs. As the owner of a childcare center, you need to pay attention to the news for lice or flu outbreaks or any other illnesses that might be sweeping across your area and take extra precautions to keep your business clean and germ free.